A silhouette of a damaged twisted Pencil Pine, wearing a fine dusting of fresh snow and precariously positioned above the Pool of Siloam in the Walls of Jerusalem National Park, is like a portrait of a lively old friend. A fresh ice sheet, uniquely patterned, is coloured by the alpenglow, as the day’s first sunlight reflects on a Cradle Mountain tarn. A flowering white Olearia pinifolia at the base of a massive boulder on Mount Wellington is a study in permanency and transience. Here, too, are photographs of the Snowy Mountains and the tropical rainforests of Queensland’s Daintree and Hinchinbrook Island, Fiji and Borneo. Bob Brown and Peter Dombrovskis forged their friendship in the battle to save the Gordon and Franklin rivers. As a founder of the Wilderness Society, Bob organised the blockade of dam works on the Franklin, recruiting Peter and his iconic photography to make the case for conservation over profit. During the campaign, Bob accompanied Peter on one of his kayak trips down the Franklin and observed his process as a photographer. 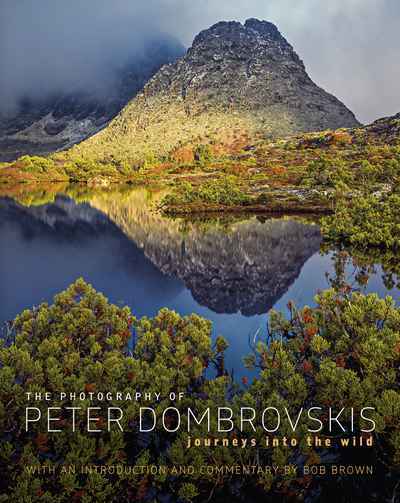 Peter would go on to take one of the most famous photographs in Australian history, Morning Mist, Rock Island Bend, Franklin River, an image that featured in calendars and diaries across Australia and that was integral to the success of the campaign. The two remained friends until Peter’s death in 1996.